「인목왕후 어필 칠언시(仁穆王后御筆 七言詩)」는 선조(宣祖)의 계비(繼妃)인 인목왕후(仁穆王后, 1584~1632)가 큰 글자로 쓴 칠언절구의 시이다. 종이바탕에 4행으로(각행 7자) 썼으며 근대에 족자로 장황되었다. 어필 아래에는 서예가 배길기(裵吉基)의 1966년 발문이 있다. 바탕은 보존이 양호한 편이며 다만 줄[行] 사이가 좀 더 밝다. 한편 어필 칠언시 28자의 점획 안에는 제월당(濟月堂)이란 스님의 발원문 29자가 작은 글자로 진하게 쓰여 있다. 칠장사는 인조가 반정으로 등극한 1623년에 인목왕후가 친정아버지와 아들(영창대군)의 명복을 빌기 위하여 원당(願堂)으로 삼아 중창한 사찰로 이곳에는 인목대비가 썼다는 이 전래되었는데(현 동국대박물관 소장), ‘인목왕후 칠언시’와 서풍이 같다. 인목왕후의 글씨는 선조어필과 비슷하며 그의 딸 정명공주(貞明公主)가 따라 썼다. 이 어필을 나무판에 모각한 것(명안공주관련유물(明安公主關聯遺物, 보물 제1220호))과 검은비단에 금니로 모사한 것이 전하는데(국립중앙박물관, 德 2053) 모두 이 어필과 자형이 같다. 다만 모본에서는 칠언절구 28자를 3행으로 배열하고(각행 10자) 글자 사이를 조절하였다. 조선시대 열성(列聖)의 어필이 많이 모각되었는데, 이처럼 모각된 어필의 원적(原蹟)이 남아 있는 예는 매우 드물다. 특히 왕후의 글씨는 간찰체제로 자필 또는 서사상궁의 필치로는 전하고 있지만 한자 대자(大字)는 명성왕후의 예필을 빼면 현재로서는 ‘인목왕후 칠언시’외에 사례가 발견 되지 않고 있다. This is a seven-word quatrain written by Queen Consort Inmok (1584-1632), the second wife of King Seonjo, in large characters. 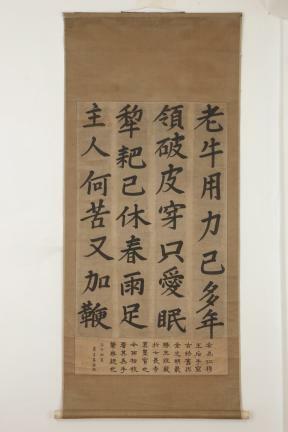 The four-line poem (seven characters in each line), in four long vertical strips of paper, was mounted to a scroll sometime in the recent past. A postscript by Bae Gil-gi, a modern Korean calligrapher, dated 1966, is added below the queen’s calligraphy. The bottom sheet is in fine condition, but the color appears slightly too bright between the calligraphy strips. Meanwhile, inside the strokes of the twenty-eight characters making up this seven-word poem, there is a twenty-eight word text written by a monk named Jewoldang, in tiny, dark-ink characters. Chiljangsa Temple was chosen by Queen Consort Inmok as the place to pray for the souls of her father and son (Prince Yeongchang), in 1623, the year when King Injo was restored to the throne, and was renovated during the same year, under a project funded by her. A hand-copied Suvarna-prabhasa Sutra (Sovereign Kings of the Golden Light Sutra) among the historical treasures housed in this temple is said to have been written by Queen Consort Inmok (currently in the collection of the Dongguk University Museum). Indeed, the handwriting in this sutra is identical in style to the one in the seven-word poem. Queen Consort Inmok’s handwriting is quite similar to that of King Seonjo, and influenced the handwriting of her daughter, Princess Jeongmyeong. Other version of this same calligraphy have survived to the present, including a wood block (Relics Related to Princess Myeongan, Treasure No. 1220) and a reproduction written in gold, on a piece of black silk cloth (National Museum of Korea, Accession No. : Deok 2053); both of which match exactly this scroll calligraphy in character form. But, in these two reproductions, the four-line, twenty-eight character poem is re-arranged into three lines (ten characters in each line) by readjusting the space between characters. During the Joseon Dynasty, past kings’ handwriting samples were often reproduced in wood blocks. But, their originals have rarely survived. Extant writings of queens are most often letters either written in their own hand or in the hand of a lady-in-waiting. 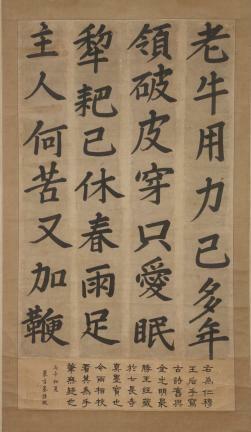 As for writings in large Sino-Chinese characters, this seven-word poem by Queen Consort Inmok and writings by Queen Consort Myeongseong are the only extant examples.